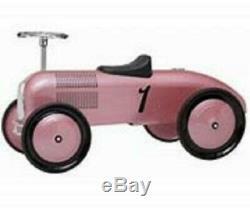 Kids Racing Car Steel Made Rose Metallic Pink Foot to Floor Ride on Car. Sleek rose colored ride-on scoot-ster will go, go go! Features authentic 1930 racer detailing, working steering wheel and rubber wheels, and its heavy gauge steel construction is built to last. Finished in a chip and rust resistant, child safe, non-toxic, lead-free powder coating paint. Steel 9 wheels and rubber tires provide smooth rolling on sidewalks, driveways, and patios, requiring only the push of the foot from a rider aged 18-36 months old. Braking is provided by foot power. The seat adjusts fore/aft, and the steering wheel provides easy, confident turns. Shoes must be worn when operating this car. Orders after Friday at 1P. We offer a return period of 14 days from date of receipt. Defective or wrong item received must be notified to us no later than 3 days after receipt. Pictures of defective items might be requested. Opened and/or unsealed DVDs, CDs, and cartography are not returnable unless defective. Listing and template services provided by inkFrog. The item "Kids Racing Car Steel Made Rose Metallic Pink Foot to Floor Ride on Car" is in sale since Wednesday, March 6, 2019. This item is in the category "Toys & Hobbies\Classic Toys\Other Classic Toys". The seller is "darla-mom" and is located in Paterson, New Jersey. This item can be shipped to United States, Canada, United Kingdom, Denmark, Romania, Slovakia, Bulgaria, Czech republic, Finland, Hungary, Latvia, Lithuania, Malta, Estonia, Australia, Greece, Portugal, Cyprus, Slovenia, Japan, China, Sweden, South Korea, Indonesia, Taiwan, South africa, Thailand, Belgium, France, Hong Kong, Ireland, Netherlands, Poland, Spain, Italy, Germany, Austria, Bahamas, Israel, Mexico, New Zealand, Philippines, Singapore, Switzerland, Norway, Saudi arabia, Ukraine, United arab emirates, Qatar, Kuwait, Bahrain, Croatia, Malaysia, Brazil, Chile, Colombia, Costa rica, Dominican republic, Panama, Trinidad and tobago, Guatemala, El salvador, Honduras, Jamaica, Viet nam, Uruguay.